Prior notice of important opportunities, helps identify the right time to handle any change of relationship, job or home, see through deceptions and learn you can say no in a positive way. Precise dates help you face up to situations you have previously avoided and instead deal with challenging periods. Know when to slow down and take stock when necessary and identify the right time to make a decision. How do we know? Tracking the 'movement' of the planets through the Solar System, your Forecaster interprets the interplay between the planets - it reveals the circumstances that can lead to how you change, grow and develop. 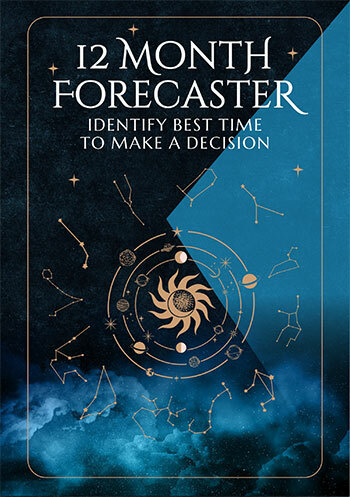 Forecaster should only be used as a helpful guide.